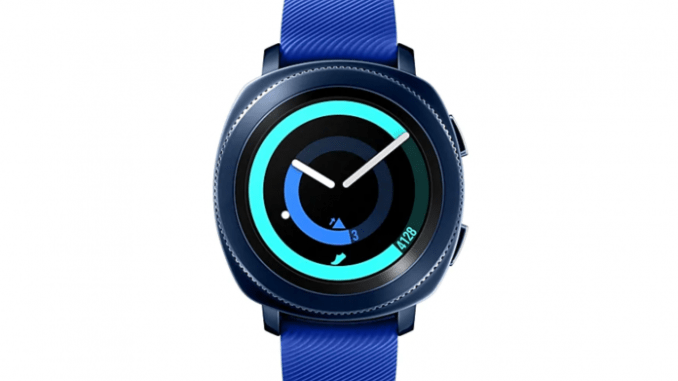 Resource 91mobiles shared the image of smart watch Samsung Galaxy Sport codenamed Pulse, whose announcement is yet to be expected. According to the source, the render was obtained from a reliable source. Samsung Galaxy Sport will be the first Galaxy sportswear watch company to use for the Gear series. As you can see on the render, the clock received a circular dial-dial with almost no frames and two round buttons on the case. The body and strap buckle are made in the same color range. The back side of the clock is not visible, but the former set of sensors is expected. The device is equipped with GPS, will allow tracking the pulse, sleep and user activity, counting the steps. Also provided for protection against water and dust, but it is unknown how powerful it is. Earlier it was reported that the Samsung Galaxy Watch will receive support for Bixby reminders, 4 GB of flash memory, Wi-Fi modules (802 b / g / n), Bluetooth and NFC for contactless payments. The official debut of the clock is expected simultaneously with the Samsung Galaxy S10 smartphone series at the Unpacked event on February 20th.